The European Union (28 countries) is the largest target for the export of tree nuts from the United States, with 32% of the total US produced in 2017,Also Its big in buy Iranian pistachio. The share of East Asian countries was 27% in imports of tree nuts and 12% in the Middle East. 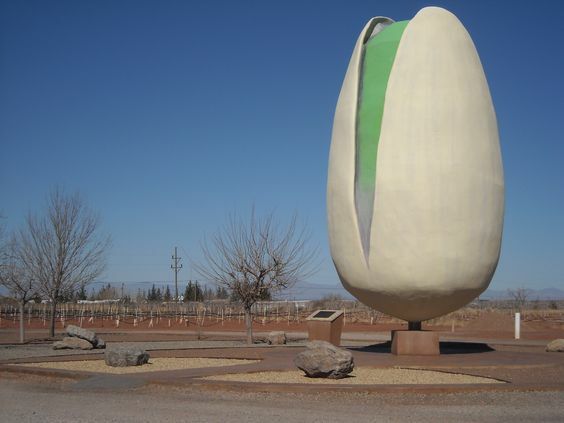 Almond (dry in shell and kernel) $ 1.5 billion, dry pistachios ($ 44.6 million) and walnuts worth $ 344 million. Within the European Union, the most important destinations for American nuts are as follows: Spain, Germany and the Netherlands, accounting for 63% of total imports into Europe. The United States is the largest supplier of tree nuts to Europe. In 2017, the share of the source in the European market was 37%. 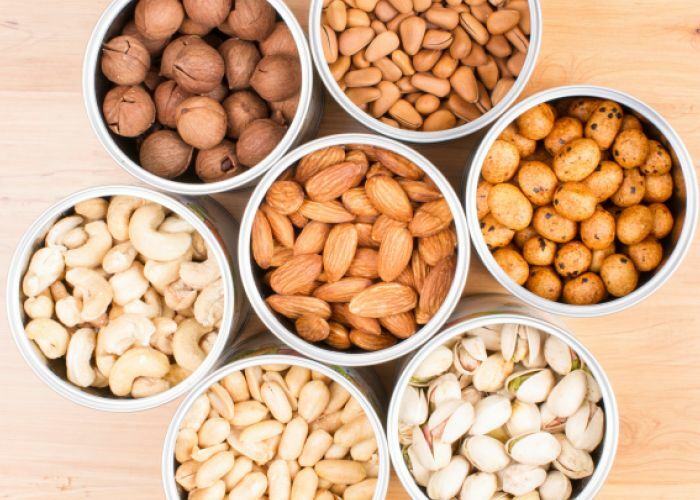 Turkey has a second share of the European market (20%), followed by Vietnam, Chile, and India, and almond is still the main commodity, with a share of the total import of nuts to the European Union of 22%. Almonds are used more as an ingredient in the production of marzipan, nougat, toron (spanish specialties for Christmas), other sweets and pastries. European growers use pistachios and walnuts for use in ice cream and confectionery. The European Nutrition and Nutrition Industry is constantly striving to offer new products and methods for consuming more nuts. However, it is not easy to introduce new products in traditional markets like Spain and Italy. In these markets, consumers often prefer familiar food products. Because of the large European marketplace, the focus of food retailers has been to develop strategies for the production of new value added products to sell more commodities in bulk. Since the EU is the main destination for exporting tree beans, American exporters are always looking to expand their trade with these countries. To exporters who have recently entered the food business, it is recommended to refer to the FAIRS reports (including standards and regulations for the import of food and agriculture to the European Union) for more information on EU food regulations and familiarizing them with market opportunities. Associations such as the California Almond Alliance (ABC), The American Pistachio Association (APG) and the Cervical Cancer Commission (CWC) are always seeking to develop business strategies in the European Union market. These business associations or industry activists, in collaboration with agricultural services offices throughout Europe, are always seeking to increase the market opportunities for tree vegetables. Pistachios in Italy are a traditional product, especially in Sicily (Bronte Region), which supplies 90% of Italian pistachio. In recent years, pistachio production has also expanded to some extent in other areas in Sicily and Basilicata. In these areas newer and more efficient gardens are built. Bianca (or Napoleon) is the main pistachio in Italy, which is usually harvested in September. Since 2004, the European Commission has awarded the Brontot Pistachio with a PDO (protected designation of origin), distinguishing it from other varieties of pistachios in the world. Spanish consumer interest in pistachios is on the rise, as well as pistachio production in Spain, which is undergoing rapid growth. It is true that pistachios in Spain are not considered to be a traditional product, but high profitability and high demand for this product in the past 10 years has caused the pistachio crop area to rise substantially in Spain. The production of domestic pistachios is still low, but it is also expanding. 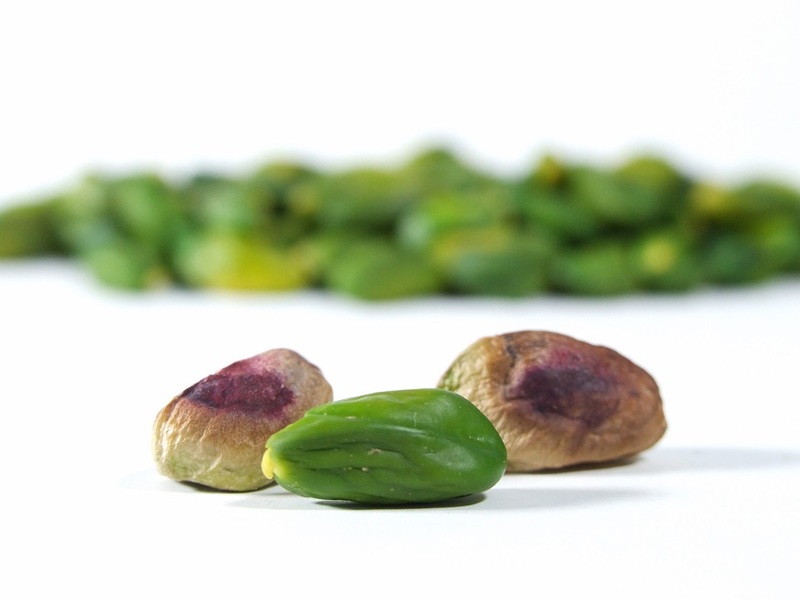 The Castile-La Mancha region has the highest increase in pistachios and production. The expansion of pistachio cultivation is a long-term investment that is expected to continue to increase. 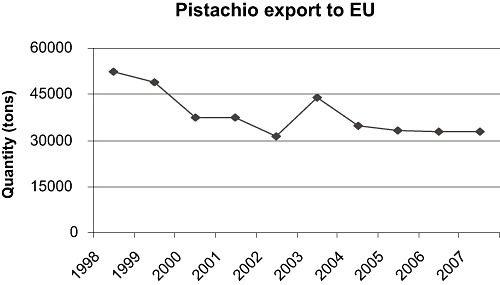 Pistachio production within the EU does not cover domestic demand, so a significant amount of pistachios from Iran and the United States are imported into the European Union. 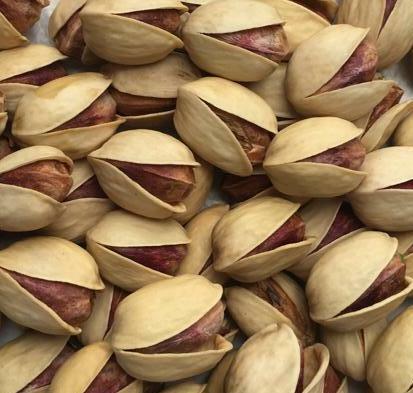 Pistachios are consumed in various forms in Europe, Use of dry in shell (with skin) as nuts to the consumption of pistachio kernel in the restaurants, cakes, sweets and other food industries and green pistachio powder and pistachio paste in ice cream. The European Union is one of the main importers of pistachios in the world. Iranian pistachio and the United States pistachio have the biggest share of European pistachio market. These two countries together have more than 90% of the total pistachio imports to Europe in their hand. In the European Union market, buy Iranian pistachio is the main rival of the United States. Iranian pistachio flavor is still better than American pistachio, and this is the most important advantage of Iranian pistachios ( Table 2 ) . Exports of pistachios from the EU are very small. The main purposes of pistachio produced in the 28 EU countries in 2016 were the Mellá and Monte Carlo autonomous cities of Spain (Table 3). Do not give nuts and Iranian pistachios to dogs! Anyone who looks at the picture above may have a craving for Iranian pistachio and nuts and likes to take a handful of it; but this is only for humans and some animals, for dogs it is nothing but poison. It’s really important to know what hurts your dog and what is good for it. Some low-skilled and inexperienced owners give their dogs nuts, which will make the poor animal suffer from digestive problems and poisoning. Walnut poisoning is one of the most common diseases in dogs. The average cost for walnut poisoning treatment is 419 $ and for stomach discomfort is about 72 $.
. Eating a black walnut can cause stomach discomfort or bowel obstruction (ileus) in dogs. Furthermore, moldy black walnut may have tremor genic mycotoxins which can cause seizures or nerve symptoms in dogs. Dogs love the taste of almonds , Almonds are not poisonous but Dogs cannot easily digest it and can causes stomach discomfort. American walnuts also contain jug lone poison that can cause lameness in the horse. this nut in dogs can cause bowel and stomach discomfort. nuts contain an unknown type of toxic (poison) that can lead to neural disorders. English walnut causes stomach Pain (abdominal pain) or even bowel obstruction in the dog’s body. Such as black and Japanese walnuts. So protect your dog with keeping away Iranian pistachios and nuts from them. how about Iranian pistachio and nuts covered in chocolate? Nuts covered in chocolate or other candy coatings are even more dangerous. But as you know, it is very useful for human’s body and heart health and, and we will offer you a daily consumption of some Iranian pistachios for a better life. it is very useful for human’s body and heart health and, and we will offer you a daily consumption of some Iranian pistachios for a better life. In this Article we talk about Iran pistachio and world pistachio. USA and Iran pistachio cover more than 75% of world pistachio product, what pistachio trees need? The United States and the Islamic Republic of Iran are world leaders in the production and cultivation of pistachios. Republic of Turkey, and Syrian Arabic Republic is ranked in the production of pistachios after the United States and Iran. but most of their products are consumed locally, or partially are exported to countries in Their respective areas. but still statistics shows the United States and Iran are both importing. as we know Iran re-exporting of their imported pistachio after some processing on it. Major importer countries of pistachio. The largest import markets for pistachios are Hong Kong, the People’s Republic of China, Canada, Germany, Belgium, the Netherlands and Russia. Hong Kong is the gateway to China, and also re-exporting it from china to other countries. Germany, Belgium, Luxembourg and the United Arab Emirates also act in the same way and are in the next positions. World production of pistachios exceeded 524,000 tons in 2015-2016, up 24% compared to the same period in the past 10 years, 2005-2006, now production of pistachio reached to 1.1 million tones, it shoes 3.29% yearly increase from 1997. In 2016 global production, Iran produced 210,000 tons (40% share), after that Turkey with 145,000 tons (28% share) and the United States with 127,000 tons (24% share). These countries, as the largest pistachio producers, supply about 92% of the world’s total pistachio. According to statistics released by the FAO, the United States produces 406,000 tons of pistachios per year, the world’s first largest producer of this product. Iran is ranked second in production of 315,000 tons of pistachios. Iran’s closest rival is Turkey, with 170,000 tons’ production. and its Production has tripled in 4 years in the coming years. terms of weather and environment, which has very cold winters and hot and long summer. And Usually these conditions are provided at an altitude of 800-900 meters above sea level. In Kerman province, Iran pistachio trees also planted at the height of 1850 meters. Today,Iran pistachio cultivation and production are carried out at lower altitudes and produced a good crop. suitable temperature for cultivating this plant is 45 ° C in summer and 20 ° C in winter. Pistachio is susceptible to late spring frost, and the temperature of freezing and even close to it will cause a lot of damage. However, the summer heat is necessary for the growth and pistachio kernels development and should be enough. And in calcareous and passionate soils its tolerance is better than other fruit trees. But in shallow, hard and rocky soils it does not produce good crop. The best Iran pistachio soil is sandy clay soils The greater depth and the more uniform, makes pistachio trees grow better and faster and give more iran pistachio. (Sodium adsorption ratio) was less than 3.5 0.7 ds /m.There is no limit to using this kind of water irrigation. 2-If water EC (Electrical Conductivity) was greater than 2 (ds / m), it will accumulate in salts, may cause accumulation of salts. For this reason, using of these waters will be restricted. Irrigation water witch its SAR (Sodium adsorption ratio) was greater than 7, cause reduce water penetration in the soil. In this case, the imbalance between calcium –magnesium and sodium causes Particle dispersion. Iran located in the dry and semi-arid region of the world and the average annual rainfall is 250 mm, which is one third of the world’s average rainfall. in other hand, the evaporation rate of the free surface of water and soils in Iran is equal to 2 meters and is equal to three times (triple)the average evaporation in the world. Water requirement of plants directly related to rainfall and evapotranspiration, and the need for water increases with lower rainfall and higher plant evapotranspiration. One of the ways to increase irrigation efficiency is to use ways that need less water with the rate of performance that is not significantly altered by reducing water consumption. due to the fact that the pistachio plant in the First year,it has just been transported to the main place and it has little growth, so their actual demand is much less than 4 thousand cubic meters, and even less than a thousand cubic meters per hectare in the first year. Since the role of water in life is very important, it can be saved by advanced and modern methods in the agricultural industry for irrigation, and even can provide more crops with better quality. we all must help the life of future generations. so total available Iranian pistachio for 2018 is about 90 to 100 tones. 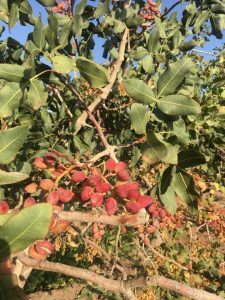 The quality of pistachios, especially the Fandoqi variety, is significantly better in compare with previous years, due to the low amount of each tree’s crop, pistachio trees had the proper nutrition. Due to the sharp fluctuations in the dollar exchange rate and the fact that Iran’s pistachios are mostly exported, pistachio holders will not have much incentive to supply this product this year. Along with low supply, there is no significant demand on the market, and the atmosphere in these days of the market is not good. And businessmen are either observing the market or are happy about sudden profits or discomfort from overnight losses in these extreme fluctuations. about 45-55 thousand tons and it’s almost the same from last year in stock. so total available Iranian pistachio for 2018 is about 90 to 100 thousand tones. Pistachio tree buds were very low in the last spring 2018, as a result, we saw very little pistachios crop. A review of the status of pistachio trees promise lots of blooms in next year, we hope to have a good crop for next year. “Last year was a hard year for farming and animal husbandry in Kerman province, where more than 85% of the province faced severe drought”. Head of Agriculture Organization of the northern province, considered Kerman province as one of the main agricultural center in Iran. 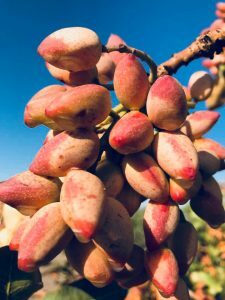 “the excessive heat in April and the fluctuations temperatures in February unfortunately caused more than 90 percent of the province’s Iranian pistachios to be wasted”. And Due to climate change only 10000 tons’ pistachio left from 90000. As a result of the untimely cold weather on 18, 19 and 20 April last year, about 18,000 tons of the Walnut spoiled. Unfortunately, the temperature that increased in July and August also disappeared about 30,000 tons of the province’s date, while the drought caused the drying up and There were a lot of Qanats in the province. Due to the last year’s April coldness About 18,000 tons of province walnuts were spoiled and, unfortunately, the temperature increase in July and August also destroyed about 30 thousand tons of province dates. “climate change and droughts caused huge damage to the livestock and Animal Husbandry”. Next year, Kerman province will rank first in pistachio production. also said: “We expect the next year to be a fairly good year for pistachio producers”. All Iran pistachio mentioned in this article meant to be raw and unsalted because for pregnant woman salty Iran pistachio is a poison and can put their health and their children at risk. Iran Pistachio has a lot of Medicinal virtues that preventing cardiovascular disease and has an important role in reducing blood fats. But having Iron in this product makes it the best food for people with anemia and we advise to eat pista in pregnancy. Generally, each ounce of Iran pista (about 30 grams) has 6 grams of protein, 3 grams of fiber, 12.7 grams of total fat and 160 calories. About 20 pista can supply all the iron and folate , calcium and potassium needed by a pregnant woman and her baby. 4. Eating pistachios during pregnancy can reduce cholesterol. The Iranian pistachio contains unsaturated fatty acids, which can reduce bad cholesterol and increase the level of good cholesterol in the blood. Reducing bad levels of cholesterol means keeping your body’s arteries open and do the perfect Heart blood flow. It also increases lipids during pregnancy. Iran pistachio is a rich source of antioxidants, such as polyphenolic compounds, vitamin E and carotene, which boosts the immune system.Quoting from Dr. Penny Chris’s Research: “Our studies have shown that pistachio is a healthy diet for the heart that reduces the risk of cardiovascular disease in humans. Iran pistachio is rich in antioxidant lutein. Lutein is usually found in green vegetables and brightly colored fruits. Pistachio among the nuts is on a higher level in terms of nutrition. The walls of the carotid artery, the main blood supply to the head and neck, thicken and harden with age, and doctors check the thickening for early signs of vascular disease. In this study, 144 adults with early-stage hardening of the arteries took a placebo, 20 mg of lutein, or the lutein plus 20 mg of lycopene per day. After 12 months, while there were no changes in the placebo group compared to the start of the study, carotid artery thickness decreased by 0.035 mm in the lutein group, and by 0.073 mm in the lutein and lycopene group. Also, beneficial blood concentrations of lutein and lycopene increased significantly. Doctors said that to protect against hardening of the arteries, lutein appears to be effective, and lutein together with lycopene may be more effective. Iran pistachio has anti-inflammatory nature that protects you from swelling and joint pain. Pregnant women usually suffer from constipation and Iran pistachios can help them as a fiber rich source. Iran Pistachio is useful for the health of the eyes because of having carotenoids . 12.Eating pistachios during pregnancy can help you to have a healthy skin. In some traditional medicine texts talked about food with mixture of sugar, pistachio and Cardamom combinations. In ancient times in Iran, grandmothers had been preparing this for Women who have just given birth to a baby to give them boost so that they would gain strength with using this potion and would quickly finish their recovery. To make this potion, which can also help boost girls’ strength during menstruation, Iranians crushes raw pistachios with sugar and they add a little bit of Cardamom. The use of this potion as a nutritious food can help increase the nutritional capacity of girls and women in food supplements. Women who have diabetes at the time of pregnancy should have a special diet. This kind of diabetes mostly appears during the pregnancy and Resolved with the birth of a baby. If a diabetic pregnant woman has a normal weight, she can use all types of fruits and vegetables throughout the day, but she should avoid the simple sugars that they eat in various foods, include milk and dairy foods in their breakfast, and cooked foods Avoid. In fact, a good diet for gestational diabetes involves consuming healthy foods and avoiding fatty foods,too salty or full of sugar. Also, this group of pregnant women is advised to incorporate a variety of fiber materials in their diet, and, in the other hand, minimize using of saturated fats and trans fatty acids, and instead use of beneficial unsaturated fats such as omega-3, omega-6, and Olive oil. Because of importancy of pregnancy period, proper nutrition during this period is important because of the baby’s growth and mother’s health, a pregnant mother who has GDM (Gestational diabetes mellitus) should be under the nutritionist’s supervision and using of a healthy diet. According to research results in the recent issue of the American Heart Association, exposure to neurological stress and nervous pressure may increase blood glucose, and this increase is very severe in people with diabetes. The consumption of raw pista in mothers with diabetes makes it possible to control their blood pressure and improve heart health. The report says that taking two servings of salt-free pistachios per day can reduce vascular contractions and lower the heart’s pressure. Diabetes is caused by the body’s disability to make or use insulin. Insulin is a substance produced by the pancreas and its main role is to use sugar as the largest source of energy for the body. The grows rate of diabetes type 2 in the United States has doubled in the last decade, about 26 million American citizens now suffering from the disease. Therefore, there is always a need for complementary and natural strategies to control and Inhibition of this disease. Diabetes Type 2 is the most common type of diabetes. The body does not produce enough insulin, or the cells ignore the amount insulin they produced. diabetes Type 2 is mostly seen in people who working at night shift. can put Iran pistachios in frozen yogurt, barley soup and milk and cereals and eat it as a breakfast. A miracle called (GHOV’VATOO) as we mentioned there is a mixture of sugar, Iran pistachio and Cardamom combinations and it’s the best food for postpartum. • Use of pistachio oil to heal surgical wounds. • Takes skin rejuvenation and prevents it from wrinkling. • This oil because of its rich vitamin E, protects the skin health and repairs the skin cells. You should know this oil is a therapeutic aspect and its phosphorous increases its intelligence and memory, and its folic acid helps the development and development of the nervous system of the fetus. Conceder Eating this oil also has a therapeutic effect, and its phosphorus helps to increase the intelligence and memory and its folic acid help to the development of the fetus nervous system. 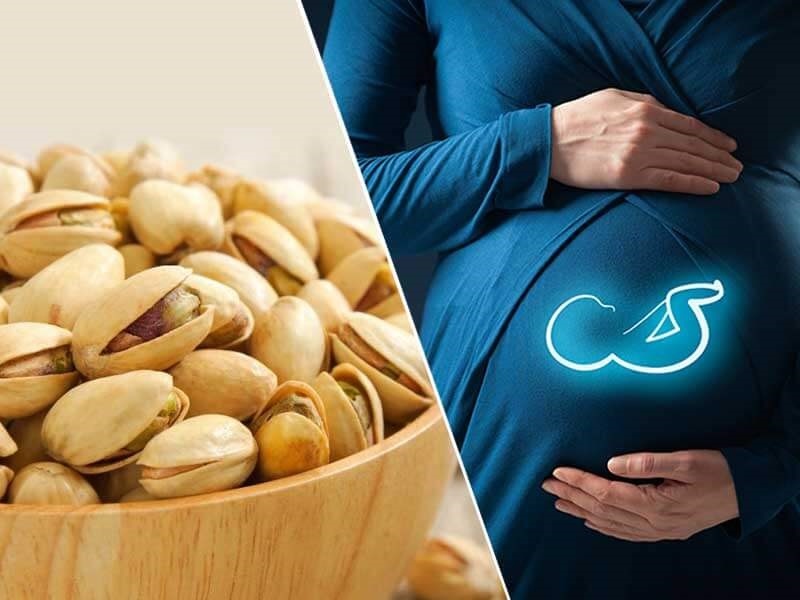 Pregnant women should control daily eating pistachios and shouldn’t eat more than ten to twenty seeds because they may be harmful and talk to the doctor before taking nuts and ask them for their complications. Iran Pistachios contain Fructose that make digestion difficult, causing diarrhea, constipation, abdominal pain and bloating. salted Iranian pistachios have a large amount of sodium, which increases blood pressure and therefore it’s not desirable during pregnancy. 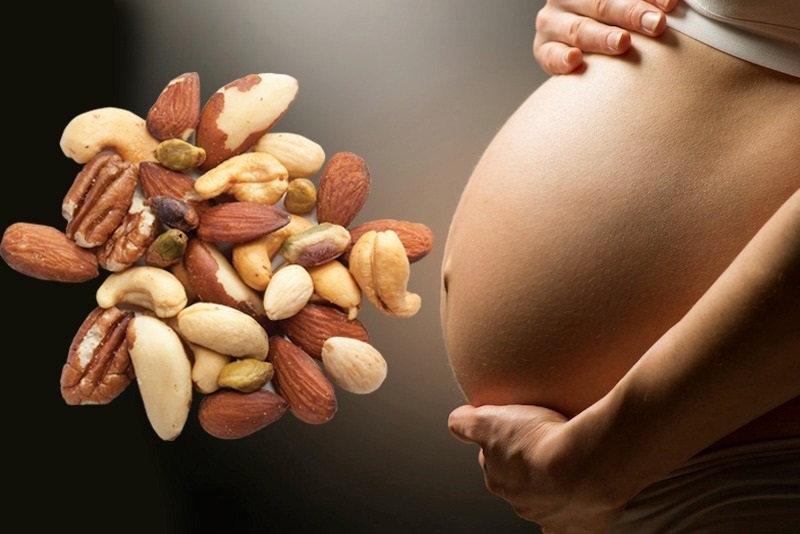 If you are allergic to nuts, it’s best to avoid taking them during pregnancy. Learn more about pregnancy sensitivity. Anticardia acid is a chemical compound that exists in nuts It causes sensitization. Symptoms include itchy skin, shortness of breath, abdominal pain, nausea, and diarrhea. Excessive consumption of Iranian pistachios during pregnancy increases the risk of asthma and some respiratory disorders in newborns.In a study conducted by Dutch scientists, it was found that 50 percent of infants whose mothers consumed large amounts of nuts during pregnancy increased the risk of developing asthma.Children’s chest pains and shortness of breath can be a reason for this claim. So talk to your doctor before having nuts. Eating about 20 Iran pistachios a day is enough, and excess consumption is not recommended due to its excess calories and doctors advise women to use only 300 kcal per pregnancy to prevent overweight and obesity during pregnancy. Iran pistachio kernel is one of the rich sources of fatty acids, but it is not recommended for people with high levels of triglycerides. It is also not suitable for stomach because of the difficult digestion. It’s good to know that eating Iranian pistachios is harmful for people who have liver problems and whom are suffering from gout, diabetes and kidney disease. Avoid alcohol during pregnancy.Alcohol consumption is associated with preterm labor, subjective malnutrition, congenital defects and low birth weight. Reduce total fat intake to 30% or less than total daily calories. For example, a person who receives 2,000 kilos calories a day can consume 65 grams of fat or less per day. Avoid using cheeses that are not pasteurized, they may cause infection. But you can use pasteurized and processed cheeses or yogurt. Avoid using raw seafood, especially shrimp. During pregnancy, you may have mild nausea, diarrhea or constipation. So consider these suggestions. Eat some biscuits before you get out of the bed. Avoid high-fat and fried foods seriously. Eat foods that contain fiber such as apple sauce, banana, white rice, barley flour, refined wheat bread, because they help to absorb water. Drink milk before eating your meal. Reduce the consumption of drinks and foods containing caffeine. Don’t let this cold weather keep you away from having Iran pistachio ice cream. the whole pint has only 240 calories and 20 gr protein. The question is why Avocado? Avocado has many nutrients that your body needs. Avocados have more potassium than bananas, which is essential for muscle growth and organ function. About 30 grams of avocado can account for 8 percent of your body’s need for vitamin K per day, which makes blood clot. It also contains vitamins C, E, and antioxidants that will strengthen the immune system. Other nutrients found in avocados include folate, riboflavin, fiber, and vitamin B-6. At the end we add some spirulina which Helps to reduce weight, prevent cancer, reduce cholesterol, fight fatigue or aging. And if it’s hard for you to eat avocado alone u can make this healthy and delicious desert and eat it as a breakfast. for buy Iranian pistachio please contact us. Iran pistachio and International pistachio production and trade is about 100 years old. Iran’s pistachios are exported to nearly all countries of the world. The construction of a pistachio garden is a long-term investment in which the farmer will risk investment at least for the next 15 years. Annual pistachio production in Iran is estimated at an average of 200,000 tons. Pistachio production last year was estimated at 225,000 tons , while production of this year is projected at 55,000 tons due to the unprecedented damage caused by the climatic conditions of the spring. According to estimates, more than a million people in more than 15 provinces of the country have income from the Iran pistachio industry. Usually about 80 percent of Iran’s pistachio production is exported and 20 percent of it is consumed internally. Due to the larger export market, the price of pistachios is determined by its price on the world ,Therefore, the domestic price of pistachios is always the result of multiplying its global price market by the rate of Rials against foreign currencies. Pistachios in the world are mainly exported in bulk, pistachio traders and sellers in the countries of destination, according to the taste of the market are, consumed, packed, marketed, and then sold it. Pistachio production last year was 275,000 tons.This year’s production in the United States is estimated at 450,000 tons. Normaly, Iran’s pistachio farmer’s sales price is about 95% of the export price of pistachios by Iranian businessmen. Also, the average margin of pistachio exporter’s profit is less than one percent of its export sales price. This means that 99 percent of the currency from the export of pistachios is paid back to the farmer to pay the farmer and cover export costs. The return of foreign exchange from pistachio exports due to international political and banking sanctions has long been done only through the capillary network and informal network created between Iranian and foreign traders.